On November 28, 1999, our precious little Micro became Heaven's littlest angel. 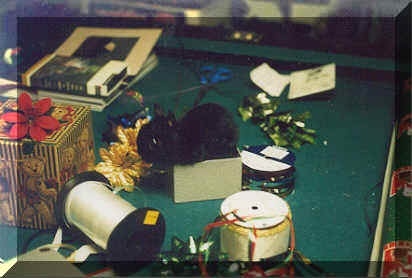 Micro, pictured here at age 17 months, was a full grown Mini Rex that had beaten the odds for survival. She was a year old on June 19th and at 17 months only weighed 11 ounces. Normal weight for this breed is 4 to 4-1/2 pounds. She was born with a "double dwarf gene" that is generally accepted as "always lethal" but Micro was proof that anything is possible! There were 3 peanuts and 2 normals in the litter. The 3 peanuts were moved to a Netherland Dwarf doe with a peanut. The dwarf peanut died first, then Micro's siblings. I moved Micro to another Dwarf with a new litter until the dwarf babies got bigger than Micro. She was moved again to another new litter and by three weeks of age she was still smaller than anything in the barn and trying to jump in the feeder! At that point she became a house rabbit and remained so until her death on November 28th, 1999 when her little heart had given all she had to give. She was terribly spoiled ( a real "junk food junky") and loved to go to rabbit shows where she was the center of attention and lots of questions. She touched many lives with her courage and spirit and her passing leaves a tremendous void in our lives.